Saudi Arabia's King Salman started a month-long Asian tour with a visit to Beijing, where the two countries signed a broad range of deals potentially worth $65 billion. According to Chinese Deputy Foreign Minister Zhang Ming, they agreed on memorandums of understanding, involving everything from energy to space. "President Xi Jinping and King Salman are old friends," Zhang said as cited by Reuters. "Practical cooperation between China and Saudi Arabia has already made major achievements, and has huge potential." King Salman's visit comes as Riyadh aims to promote investment opportunities in the kingdom, including the sale of a stake in state-owned oil giant Saudi Aramco. Asian countries are vital importers of Saudi oil, and the country wants to boost sales to China. Last year, Saudi Arabia lost its position to Russia as the biggest crude exporter to China. Oil exports from Russia to China have more than doubled over the past six years, up 550,000 barrels a day. 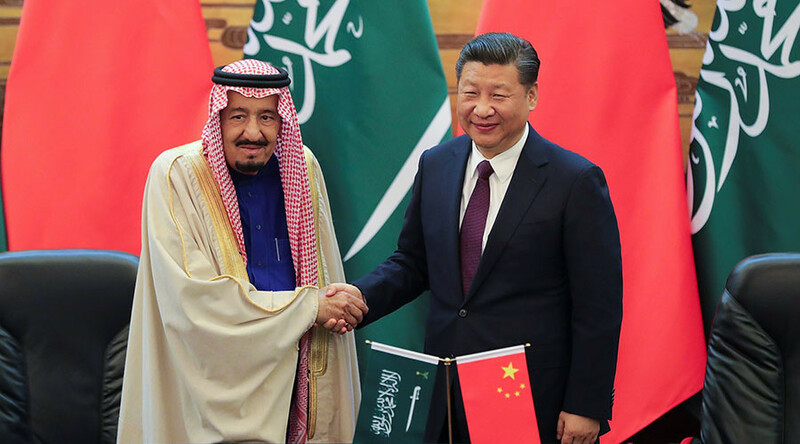 Chinese President Xi Jinping told the Saudi king his visit showed the importance he attached to relations with China. "This visit will push forward and continue to improve the quality of our relations and bear new fruit," said Xi who visited Saudi Arabia last year. Experts say Beijing’s non-interference in Middle East conflicts or diplomacy and its reliance on the region for oil is much valued. According to an unnamed diplomat from a Muslim-majority country, China was trying to play the role of "honest broker" in the Middle East, as it lacks the historical baggage of the Americans or the Europeans. "China does not take sides, and that is appreciated," said the diplomat.